Sir Alexander Fleming (August 6, 1881 – March 11, 1955) was a Scottish biological research scientist and pharmacologist, who is best well-known for his 1928 discovery and isolation of the antibiotic substance penicillin, from the fungus Penicillium notatum. Another important achievement was his discovery of the the bacteriolytic enyzme lysozyme in 1921. Fleming named both penicillin and lysozyme. He also published many articles on bacteriology, immunology, and chemotherapy. Fleming's fortuitous discovery of penicillin—the mold had accidentally contaminated a Staphylococcus culture plate and exhibited a bacteria-free halo around the mold—was one of the seminal developments in the history of medicine. However, before the remarkable breakthroughs with the drug could occur, it took a team of research scientists lead by physiologist Howard Florey, and including chemist Ernst Boris Chain, to purify penicillin and test it successfully, which they did in 1939, ten years after Fleming published his findings in 1929. 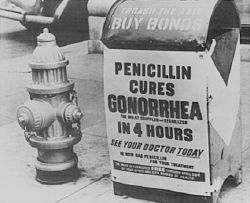 Penicillin became the most effective life-saving drug in the world, conquering such dreaded diseases as syphilis, gonorrhea, tuberculosis, gangrene, pneumonia, diphtheria, and scarlet fever. It is estimated that penicillin has saved at least 200 million lives since its first use as a medicine in 1942. The remarkable ability of penicillin to address many of the ancient scourges that plagued humanity lead its discoverer, Alexander Fleming, to become an international hero and object of public adulation by the end of World War II. He was knighted in 1944 (with Florey) and received the Nobel Prize in Physiology or Medicine in 1945 (sharing this with Florey and Chain). However, Fleming was but one of many giants in antibiotic development. He himself labeled the phenomenon the "Fleming Myth," humbly recognizing that he was the chosen representative to embody the accomplishments of the many other pioneers who developed antibiotics and made the world a better place but who remain virtual unknowns (Ho 1999). Fleming was born on August 6, 1881, at Lochfield on a farm near Darvel in East Ayrshire, Scotland. He was born into a Scottish sheep-farming family (Ho 1999). Alexander Fleming was the third of the four children of Hugh Fleming (1816 – 1888) from his second marriage to Grace Stirling Morton (1848 – 1928), the daughter of a neighboring farmer. Hugh Fleming also had four surviving children from his first marriage. He was 59 at the time of his second marriage, and died when Alexander (known as Alec) was seven. Fleming went to Louden Moor School and Darvel School, and then for two years to Kilmarnock Academy. He then moved to London, where he attended the Polytchnic (Ho 1999). After working in a shipping office for four years, the twenty-year-old Fleming inherited some money from an uncle, John Fleming. 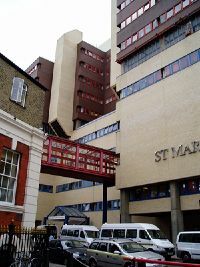 His older brother, Tom, was already a physician and suggested to his younger sibling that he follow the same career, and so in 1901, the younger Alexander enrolled at St Mary's Hospital, Paddington, London. He qualified for the school with distinction in 1906 and had the option of becoming a surgeon. By chance, however, he had been a member of the rifle club (he had been an active member of the Territorial Army since 1900). The captain of the club, wishing to retain Fleming in the team, suggested that he join the research department at St Mary's, where he became assistant bacteriologist to Sir Almroth Wright, a pioneer in vaccine therapy and immunology. He gained M.B. and then B.Sc. with Gold Medal in 1908, and became a lecturer at St. Mary's until 1914. On December 23, 1915, Fleming married a trained nurse, Sarah Marion McElroy of Killala, Ireland. Fleming served throughout World War I as a captain in the Army Medical Corps, and was mentioned in dispatches. He and many of his colleagues worked in battlefield hospitals at the Western Front in France. In 1918, he returned to St. Mary's Hospital, which was a teaching hospital. He was elected Professor of Bacteriology in 1928. Both during his military career and early in his life in medicine, Fleming was interested in antiseptics, the antibacterial action of blood, and antibacterial agents that would not be toxic to animal tissue (NF 1945). After the war, Fleming actively searched for anti-bacterial agents, having witnessed the death of many soldiers from septicemia resulting from infected wounds. Unfortunately antiseptics killed the patients' immunological defenses more effectively than they killed the invading bacteria. In an article he submitted for the medical journal The Lancet during World War I, Fleming described an ingenious experiment, which he was able to conduct as a result of his own glass blowing skills, in which he explained why antiseptics were actually killing more soldiers than infection itself during World War I. Antiseptics worked well on the surface, but deep wounds tended to shelter anaerobic bacteria from the antiseptic agent, and antiseptics seemed to remove beneficial agents produced that actually protected the patients in these cases at least as well as they removed bacteria, and did nothing to remove the bacteria that were out of reach. Sir Almroth Wright strongly supported Fleming's findings, but despite this, most army physicians over the course of WWI continued to use antiseptics even in cases where this worsened the condition of the patients. A single crystal of lysozyme. In 1921, Fleming discovered in various bodily secretions and tissues an important enzyme that he named lysozyme. Lysozyme, also known as muramidase or N-acetylmuramide glycanhydrolase, is one of a family of enzymes tht damage bacterial cell walls by catalyzing hydrolysis of 1,4-beta-linkages between N-acetylmuramic acid and N-acetyl-D-glucosamine residues in a peptidoglycan and between N-acetyl-D-glucosamine residues in chitodextrins. It is abundant in a number of secretions, such as tears, saliva, and mucus. Fleming provide the original description of lysozyme. Fleming also developed various titration methods and assays in various body fluids, including human blood (NF 1945). In 1944, Fleming was knighted. In 1945, he received the Nobel Prize in Physiology or Medicine, one of numerous recognitions. From 1951 to 1954, Fleming served as Rector of Edinburgh university. In 1955, Fleming died suddenly at his home in London of a heart attack. He was cremated and his ashes interred in St Paul's Cathedral a week later. Alexander Fleming was Catholic. Fleming's first wife, Sarah, who he married December 23, 1915, died in 1949. Their only child, Robert, became a general medical practitioner. After Sarah's death, Fleming married Dr. Amalia Koutsouri-Vourekas, a Greek colleague at St. Mary's, on April 9, 1953; she died in 1986. The popular story of Winston Churchill's father's paying for Fleming's education after Fleming's father saved young Winston from death is false. According to the biography, Penicillin Man: Alexander Fleming and the Antibiotic Revolution by Brown (2004), Alexander Fleming, in a letter to his friend and colleague Andre Gratia described this as "a wondrous fable." Nor did he save Winston Churchill himself during World War II. Churchill was saved by Lord Moran, using sulphonamides, since he had no experience with penicillin, when Churchill fell ill in Carthage in Tunisia in 1943. The Daily Telegraph and the Morning Post on December 21, 1943 wrote that he had been saved by penicillin. He was saved by the new sulphonamide drug, Sulphapyridine, known at the time under the research code M&B 693, discovered and produced by May & Baker Ltd, Dagenham, Essex—a subsidiary of the French group Rhône-Poulenc. In a subsequent radio broadcast, Churchill referred to the new drug as "This admirable M&B" (Slinn 1984). The serendipitous discovery of penicillin is attributed to Scottish scientist Alexander Fleming, who isolated, named, and described this antibiotic. However, he was not the first to note the antibiotic properties of the Penicillium, the mold that produces penicillin. Penicillium is a member of the deuteromycetes, fungi with no known sexual state. As it grows, it gives off the liquid referred to as penicillin. Many ancient cultures, including the ancient Greeks and ancient Chinese, already used molds and other plants to treat infection. In Serbia and in Greece, moldy bread was a traditional treatment for wounds and infections. In 1875, John Tyndall described the antibiotic effects of Penicillium and in 1925, D.A. Gratia did the same. However, they did not recognize the importance of this finding (Ho 1999). "When I woke up just after dawn on September 28, 1928, I certainly didn't plan to revolutionize all medicine by discovering the world's first antibiotic, or bacteria killer," Fleming would later say, "But I guess that was exactly what I did" (Haven 1994). By 1928, Fleming was investigating the properties of staphylococci. He was already well-known from his earlier work, and had developed a reputation as a brilliant researcher, but quite a careless lab technician; he often forgot cultures that he worked on, and his lab in general was usually in chaos. After returning from a long holiday, Fleming noticed that many of his culture dishes were contaminated with a fungus, and he threw the dishes in disinfectant. But subsequently, he had to show a visitor what he had been researching, and so he retrieved some of the submerged dishes that he would have otherwise discarded. He then noticed a zone around an yellow-green growth of the invading fungus where the bacteria could not seem to grow. This rare variant, P. notatum appears to have drifted there from a mycology laboratory one floor below (Ho 1999). It was also fortunate that there was a cold spell in London at the time that allowed the mold the chance to grow (Ho 1999). When temperatures increased, the Staphylococcus bacteria grew rapidly, covering the plate, but not the area surrounding the mold. However, Fleming's great personal insight and deductive reasoning allowed him to understand the importance of what he saw (Ho 1999). Fleming proceeded to isolate an extract from the mold, correctly identified it as being from the Penicillium genus, and therefore named the agent penicillin. Fleming investigated its positive anti-bacterial effect on many organisms, and noticed that it affected bacteria such as staphylococci, and indeed all Gram-positive pathogens (scarlet fever, pneumonia, meningitis, diphtheria), but unfortunately not typhoid or paratyphoid, for which he was seeking a cure at the time. It also affected gonorrhea, although this condition is caused by a Gram-negative pathogen. Fleming published his discovery in 1929 in the British Journal of Experimental Pathology, but little attention was paid to his article. Fleming continued his investigations, but found that cultivating Penicillium was quite difficult, and that after having grown the mold, it was even more difficult to isolate the antibiotic agent. Fleming's impression was that because of the problem of producing it in quantity, and because its action appeared to be rather slow, penicillin would not be important in treating infection. Fleming also became convinced that penicillin would not last long enough in the human body (in vivo) to kill bacteria effectively. Many clinical tests were inconclusive, probably because it had been used as a surface antiseptic. In the 1930s, Fleming’s trials occasionally showed more promise: Keith Bernard Rogers, who worked with Fleming, was successfully treated with penicillin for severe conjunctivitis during their research (Rossiter 2005). Fleming continued, until 1940, to try and interest a chemist skilled enough to further refine usable penicillin. Fleming soon abandoned penicillin. However, Fleming's work would become a notable starting point for the work of a team of scientists at Oxford University lead by Australian-born physiologist Howard Florey and German chemist Ernst Chain that would continue researching and then mass producing it with funds from the U.S and British governments. They started mass production after the bombing of Pearl Harbor. When D-day arrived in 1945, they had made enough penicillin to treat all the wounded allied forces. Ernst Chain worked out how to isolate and concentrate penicillin. He also correctly theorized the structure of penicillin. Shortly after the team published its first results in 1940, Fleming telephoned Howard Florey, Chain's head of department, to say that he would be visiting within the next few days. When Chain heard that he was coming, he remarked "Good God! I thought he was dead." Norman Heatley suggested transferring the active ingredient of penicillin back into water by changing its acidity. This produced enough of the drug to begin testing on animals. Sir Henry Harris said in 1998: "Without Fleming, no Chain; without Chain, no Florey; without Florey, no Heatley; without Heatley, no penicillin." There were many more people involved in the Oxford team, and at one point the entire Dunn School of Pathology at the University of Oxford was involved in its production. After the team had developed a method of purifying penicillin to an effective first stable form in 1940, several clinical trials ensued, and their amazing success inspired the team to develop methods for mass production and mass distribution in 1945. 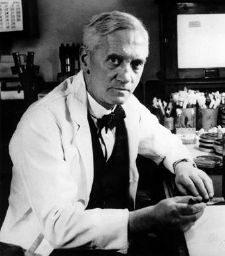 Fleming was modest about his part in the development of penicillin, describing his fame as the "Fleming Myth," and he praised Florey and Chain for transforming the laboratory curiosity into a practical drug. Fleming's accidental discovery and isolation of penicillin in September 1928 marks the start of modern antibiotics. Fleming also discovered very early that bacteria developed antibiotic resistance whenever too little penicillin was used or when it was used for too short a period. Almroth Wright had predicted the Antibiotic resistance even before it was noticed during experiments. Fleming cautioned about the use of penicillin in his many speeches around the world. He cautioned not to use penicillin unless there was a properly diagnosed reason for it to be used, and that if it were used, never to use too little, or for too short a period, since these are the circumstances under which bacterial resistance to antibiotics develops. Fleming's discovery of penicillin had changed the world of modern medicine by introducing the age of useful antibiotics; penicillin has saved, and is still saving, millions of people. Fleming received innumerable awards and recognitions for his work. In 1944, he was knighted, and in 1945 Fleming, along with Florey and Chain, jointly received the Nobel Prize in Medicine. According to the rules of the Nobel committee, a maximum of three people may share the prize. (Florey also received the greater honor of a peerage for his monumental work in making penicillin available to the public and saving millions of lives in World War II, becoming a Baron.) During his lifetime, he was awarded honorary doctorate degrees from almost thirty European and American universities (NF 1945). He received the Gold Medal of the Royal Society of Medicine in 1947, the Medal for Merit of the United States in 1947, and the Grand Cross of Alphonse X the Wise of Spain in 1948. The laboratory at St Mary's Hospital, London where Fleming discovered penicillin is home to the Fleming Museum. The discovery of penicillin was ranked as the most important discovery of the millennium when the year 2000 was approaching by at least three large Swedish magazines. It is impossible to know how many lives have been saved by this discovery, but some of these magazines placed their estimate near 200 million lives. ↑ Philadelphia Enquirer, July 17, 1945, from Brown (2004), 43 to Chapter 2. Brown, K. 2004. Penicillin Man: Alexander Fleming and the Antibiotic Revolution. Stroud, Gloucestershire: Sutton Pub. ISBN 0750931523. Haven, K. F. 1994. Marvels of Science: 50 Fascinating 5-minute Reads. Englewood, CO: Libraries Unlimited. ISBN 0585220719. Ho, D. 1999. Alexander Fleming: A Spore That Drifted Into His Lab and Took Root on a Culture Dish Started a Chain of Events That Altered Forever the Treatment of Bacterial Infections. Time.com March 29, 1999. Retrieved February 16, 2009. Macfarlane, R. G. 1984. Alexander Fleming: The Man and the Myth. Cambridge, MA: Harvard University Press. ISBN 0674014901. Maurois, A. 1959. The Life Of Sir Alexander Fleming. London: Jonathan Cape. Nobel Foundation. 1945. 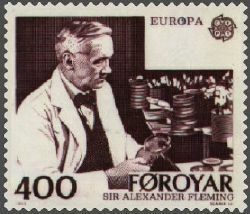 Sir Alexander Fleming, The Nobel Prize in Physiology or Medicine 1945. Nobel Foundation. Retrieved February 16, 2009. Porter, R. 1996. The Cambridge Illustrated History of Medicine. Cambridge: Cambridge University Press. Rhodes, P. 1985. An Outline History of Medicine. London: Butterworths. Rossiter, P. 2005. Keith Bernard Rogers. British Medical Journal 331 (7516): 579. Retrieved February 16, 2009. Slinn, J. 1984. A History of May and Baker 1834-1984. Cambridge: Hobson. OCLC 83379958. This page was last modified on 28 February 2019, at 16:22.